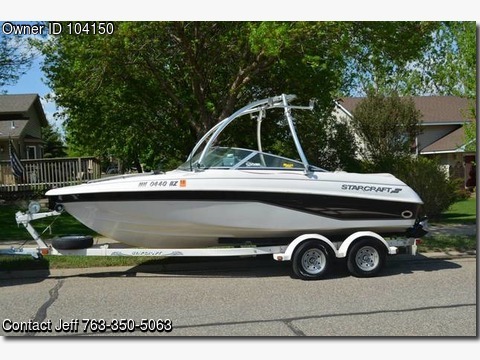 Boat is located in Becker,Mn.Please contact the owner @ 763-350-5063...2001 Starcraft Nexstar 1910 LXI - 5.7 250 HP Mercruiser w/ Alpha One drive and SS prop. Through hull exhaust w/ select for silent run, and tandam trailer, EZ Loader bunk w/ 2 spare tires. Very well maintained w/gimble bearings , billows, and water paddle replaced last year. Removable wake tower w/ ski and wakeboard holders, fish and GPS electronics, boat travel cover, bimi top, 2 spare props, one cast aluminium, one SS. Captains chair need to be reupholstered. A few scratches and dings, very good rubber and good for many more years. BONUS: Boat sold with all the toys- 3 tubes, 2 sets of skies, 2 knee boards, 1 wake board, 7 life jackets, and tow ropes.